From the Oscar®-nominated team behind the genre-defying "Embrace of the Serpent," comes an equally audacious saga centered on the Wayúu indigenous people during a crucial period in recent Colombian history. Torn between his desire to become a powerful man and his duty to uphold his culture’s values, Rapayet (José Acosta) enters the drug trafficking business in the 1970s and finds quick success despite his tribe’s matriarch Ursula’s (Carmiña Martínez) disapproval. Ignoring ancient omens, Rapayet and his family get caught up in a conflict where honor is the highest currency and debts are paid with blood. "Imagine "The Godfather" made by dazzling Latin American directors who combine bravura filmmaking with political awareness and a probing social conscience." "Three viewings in, I'm still flabbergasted by the scope and detail of this movie ... and in awe of the way its unique cover version of a crime-doesn't-pay story totally pays off. " 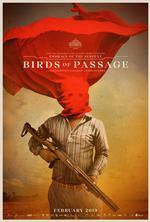 "As effectively violent and entertaining as Birds may be, there is a real current of bitterness and tragedy running through it. That bitterness speaks not of the physical colonization we saw with the conquistadors and rubber barons of Serpent, but more of a sort of colonization of ideas"
"The ease and charisma of the performers, trained and nonprofessional actors alike, heighten the emotional impact."